During our first trip to the Chili Bowl Nationals in 2001 we were phoning in updates to be posted on the website. This process consisted of T.J. running back and forth to a payphone in the Tulsa Exposition center after every race (or two races on feature night) and calling his father Bob who typed up the updates and posted them on the website. 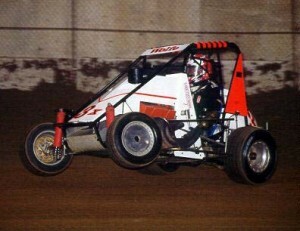 Here is a sampling of the updates from Saturday night of the 2001 Chili Bowl. Drake lead the first two laps, until Aaron Fike got around him. On lap ten Darland and Leffler both flipped hard but were okay. Drake passed Fike on lap twenty-six to retake the top spot. Swindell, Lasoski and Fike had a tremendous battle for second the rest of the way. With five laps to go JJ Yeley spun and closed the field up. Lasoski passed Sammy on the last lap for second with Fike finishing third. The track was excellent for the feature with great racing and many wheelstands. Steve Knepper finished third but flipped at the finish. Not sure how much damage he suffered. They are digging up the track again for the A Main. Three cars turned over with no injuries. Two more flips makes 54! A main hot laps have taken place with Lasoski fast. But the track slicked off pretty bad and caused lots of crashes. Right now they’re digging up the track and going to water it. It’s going to be non-stop once they get the B’s going, so TJ may not call until the A is over. January 13, 2001 at 8:19 P.M. EST: TJ reports that Jack Hewitt has raised over $4,400 for Tulsa area abused children from rides in his two seat sprint car. Tonight Hewitt has the wing on and is running some very fast laps. Doug White, that transfered from the F flipped as did Fireball Hartley. Neither were injured. Smoke went from last to 3rd in three laps, but Robert Marfia gave him all he could handle. Four cars transfer to the D mains. F Main #2: 1) Smoke Johnson, 2)Robert Marfia. January 13, 2001 at 5:33 P.M. EST: Smoke Johnson will start at the tail of the second F main shortly. Jack Miller says ” whoever this kid is, he is GOOD!” Smoke will drive a WilkePAK car. January 13, 2001 at 5:25 P.M. EST: Racing is about begin in Tulsa with a host of features ready to roar into action.